Your puppy is getting older and his agility skills are improving. 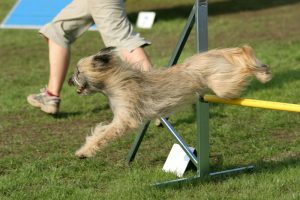 Puppy Agility 2, or instructor approval, is the prerequisite for Puppy Agility 3. Equipment is being raised toward their standard height, and correct contact behavior (2 on/2 off) is being strengthened and improved. More challenging sequences are being offered to your older and more experienced youngster. We may be doing some low jumping, especially if the pups are at an appropriate and safe age. Prerequisite for Puppy/Adolescent Agility 3: graduation from the Puppy Agility Fun 2 class, Intro to Agility, Fido Fun & Games: Agility Edition, or approval from instructor or Training Director. 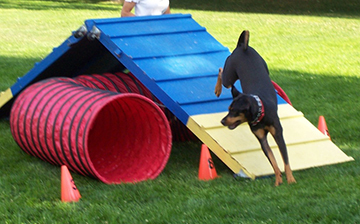 To join this class if you have not taken one of the recommended classes, your dog should be confident on a low teeter, a-frame, and dog-walk, and confident on the tunnel, tire, and table. Your dog should be coming to either your left or side on cue. Register early to guarantee a spot in the class. If you have any questions about signing up for puppy agility class, please contact Mindy Cox, Training Director at 561-427-6700.